When I was 13, I was getting ready to take a train ride through the central valley of California to visit family. My grandmother gave me a $20 just so that I would have some spending cash for the trip, but the money would never make it that far. I had just noticed in the Sunday paper that Batman had come out for the Game Boy and was on sale for $20, so I quickly hopped on my bike to go grab it so that I could play it on the train. I always had bad luck buying games, getting stuck wth stinkers because I didn’t do my research, but I definitely lucked out with this one. Batman is a side-scrolling action game based on the events of the 1989 movie starrring Michael Keaton and Jack Nicholson. You start out on the streets of Gotham but quickly move into the Acme chemical plant where you face off against Jack Napier, who transforms into the Joker after you defeat him. You then progress through the streets of Gotham City, the Flugalheim Museum, the skies over the city (flying the Batwing as in a horizontally-scrolling shooter), and finally the Gotham Cathedral. 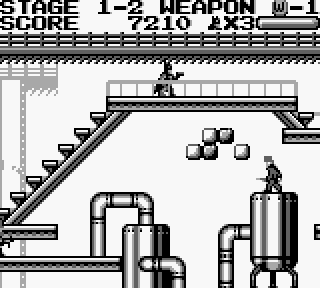 Each level is rife with suspended blocks that can be shot. Dark blocks contain items such as point bonuses, weapon upgrades, and extra lives. Shooting some blocks however will make it impossible for you to reach some darkened blocks, and therefore some of the bonus items, so you have to be careful not to shoot everything in sight without surveying the lay of the land first. The difficulty of the game remains challenging and fair, up until the last level. There the screen scrolls from right to left and you have to keep up or die from falling off of a suspended block, all while facing an onslaught of heavy fire from stationary cannons that require several hits each to destroy. This level basically requires memorization to get past, which is disappointing considering how enjoyable the game is up to that point. Had that level not been what it was, I would have scored this game a half-point higher. Nevertheless, I consider it to be one of the best action games on the platform. Buy Batman on GameGavel or Amazon. Tagged 1990, Action, Batman, Game Boy, Gameboy, Nintendo, Review, Sunsoft. Bookmark the permalink.